“Biocatalyst” redirects here. For the use of natural catalysts in organic chemistry, see Biocatalysis. Enzymes /ˈɛnzaɪmz/ are macromolecular biological catalysts. Enzymes accelerate chemical reactions. The molecules upon which enzymes may act are called substrates and the enzyme converts the substrates into different molecules known as products. Almost all metabolic processes in the cell need enzyme catalysis in order to occur at rates fast enough to sustain life. :8.1 Metabolic pathways depend upon enzymes to catalyze individual steps. The study of enzymes is called enzymology and a new field of pseudoenzyme analysis has recently grown up, recognising that during evolution, some enzymes have lost the ability to carry out biological catalysis, which is often reflected in their amino acid sequences and unusual ‘pseudocatalytic’ properties. Enzymes are known to catalyze more than 5,000 biochemical reaction types. Most enzymes are proteins, although a few are catalytic RNA molecules. The latter are called ribozymes. Enzymes’ specificity comes from their unique three-dimensional structures. Like all catalysts, enzymes increase the reaction rate by lowering its activation energy. Some enzymes can make their conversion of substrate to product occur many millions of times faster. An extreme example is orotidine 5′-phosphate decarboxylase, which allows a reaction that would otherwise take millions of years to occur in milliseconds. Chemically, enzymes are like any catalyst and are not consumed in chemical reactions, nor do they alter the equilibrium of a reaction. Enzymes differ from most other catalysts by being much more specific. 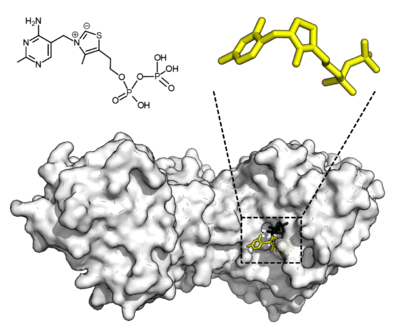 Enzyme activity can be affected by other molecules: inhibitors are molecules that decrease enzyme activity, and activators are molecules that increase activity. Many therapeutic drugs and poisons are enzyme inhibitors. An enzyme’s activity decreases markedly outside its optimal temperature and pH, and many enzymes are (permanently) denatured when exposed to excessive heat, losing their structure and catalytic properties. 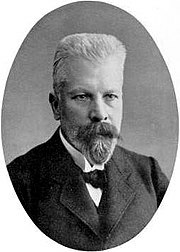 In 1877, German physiologist Wilhelm Kühne (1837–1900) first used the term enzyme, which comes from Greek ἔνζυμον, “leavened” or “in yeast”, to describe this process. 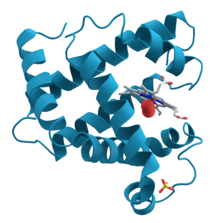 The word enzyme was used later to refer to nonliving substances such as pepsin, and the word ferment was used to refer to chemical activity produced by living organisms. Eduard Buchner submitted his first paper on the study of yeast extracts in 1897. In a series of experiments at the University of Berlin, he found that sugar was fermented by yeast extracts even when there were no living yeast cells in the mixture. He named the enzyme that brought about the fermentation of sucrose “zymase“. In 1907, he received the Nobel Prize in Chemistry for “his discovery of cell-free fermentation”. Following Buchner’s example, enzymes are usually named according to the reaction they carry out: the suffix -ase is combined with the name of the substrate (e.g., lactase is the enzyme that cleaves lactose) or to the type of reaction (e.g., DNA polymerase forms DNA polymers). The International Union of Biochemistry and Molecular Biology have developed a nomenclature for enzymes, the EC numbers; each enzyme is described by a sequence of four numbers preceded by “EC”, which stands for “Enzyme Commission”. The first number broadly classifies the enzyme based on its mechanism. Enzyme activity initially increases with temperature (Q10 coefficient) until the enzyme’s structure unfolds (denaturation), leading to an optimal rate of reaction at an intermediate temperature. Enzymes are generally globular proteins, acting alone or in larger complexes. The sequence of the amino acids specifies the structure which in turn determines the catalytic activity of the enzyme. Although structure determines function, a novel enzymatic activity cannot yet be predicted from structure alone. Enzyme structures unfold (denature) when heated or exposed to chemical denaturants and this disruption to the structure typically causes a loss of activity. Enzyme denaturation is normally linked to temperatures above a species’ normal level; as a result, enzymes from bacteria living in volcanic environments such as hot springs are prized by industrial users for their ability to function at high temperatures, allowing enzyme-catalysed reactions to be operated at a very high rate. Enzymes are usually much larger than their substrates. Sizes range from just 62 amino acid residues, for the monomer of 4-oxalocrotonate tautomerase, to over 2,500 residues in the animal fatty acid synthase. Only a small portion of their structure (around 2–4 amino acids) is directly involved in catalysis: the catalytic site. This catalytic site is located next to one or more binding sites where residues orient the substrates. The catalytic site and binding site together comprise the enzyme’s active site. The remaining majority of the enzyme structure serves to maintain the precise orientation and dynamics of the active site. Some of the enzymes showing the highest specificity and accuracy are involved in the copying and expression of the genome. Some of these enzymes have “proof-reading” mechanisms. Here, an enzyme such as DNA polymerase catalyzes a reaction in a first step and then checks that the product is correct in a second step. This two-step process results in average error rates of less than 1 error in 100 million reactions in high-fidelity mammalian polymerases. :5.3.1 Similar proofreading mechanisms are also found in RNA polymerase, aminoacyl tRNA synthetases and ribosomes. To explain the observed specificity of enzymes, in 1894 Emil Fischer proposed that both the enzyme and the substrate possess specific complementary geometric shapes that fit exactly into one another. This is often referred to as “the lock and key” model. :8.3.2 This early model explains enzyme specificity, but fails to explain the stabilization of the transition state that enzymes achieve. In 1958, Daniel Koshland suggested a modification to the lock and key model: since enzymes are rather flexible structures, the active site is continuously reshaped by interactions with the substrate as the substrate interacts with the enzyme. As a result, the substrate does not simply bind to a rigid active site; the amino acid side-chains that make up the active site are molded into the precise positions that enable the enzyme to perform its catalytic function. In some cases, such as glycosidases, the substrate molecule also changes shape slightly as it enters the active site. The active site continues to change until the substrate is completely bound, at which point the final shape and charge distribution is determined. Induced fit may enhance the fidelity of molecular recognition in the presence of competition and noise via the conformational proofreading mechanism. Enzymes are not rigid, static structures; instead they have complex internal dynamic motions – that is, movements of parts of the enzyme’s structure such as individual amino acid residues, groups of residues forming a protein loop or unit of secondary structure, or even an entire protein domain. These motions give rise to a conformational ensemble of slightly different structures that interconvert with one another at equilibrium. Different states within this ensemble may be associated with different aspects of an enzyme’s function. For example, different conformations of the enzyme dihydrofolate reductase are associated with the substrate binding, catalysis, cofactor release, and product release steps of the catalytic cycle. Allosteric sites are pockets on the enzyme, distinct from the active site, that bind to molecules in the cellular environment. These molecules then cause a change in the conformation or dynamics of the enzyme that is transduced to the active site and thus affects the reaction rate of the enzyme. In this way, allosteric interactions can either inhibit or activate enzymes. 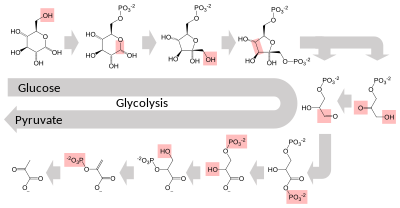 Allosteric interactions with metabolites upstream or downstream in an enzyme’s metabolic pathway cause feedback regulation, altering the activity of the enzyme according to the flux through the rest of the pathway. Some enzymes do not need additional components to show full activity. Others require non-protein molecules called cofactors to be bound for activity. Cofactors can be either inorganic (e.g., metal ions and iron-sulfur clusters) or organic compounds (e.g., flavin and heme). These cofactors serve many purposes; for instance, metal ions can help in stabilizing nucleophilic species within the active site. Organic cofactors can be either coenzymes, which are released from the enzyme’s active site during the reaction, or prosthetic groups, which are tightly bound to an enzyme. Organic prosthetic groups can be covalently bound (e.g., biotin in enzymes such as pyruvate carboxylase). Enzymes can couple two or more reactions, so that a thermodynamically favorable reaction can be used to “drive” a thermodynamically unfavourable one so that the combined energy of the products is lower than the substrates. For example, the hydrolysis of ATP is often used to drive other chemical reactions. Since inhibitors modulate the function of enzymes they are often used as drugs. Many such drugs are reversible competitive inhibitors that resemble the enzyme’s native substrate, similar to methotrexate above; other well-known examples include statins used to treat high cholesterol, and protease inhibitors used to treat retroviral infections such as HIV. A common example of an irreversible inhibitor that is used as a drug is aspirin, which inhibits the COX-1 and COX-2 enzymes that produce the inflammation messenger prostaglandin. Other enzyme inhibitors are poisons. For example, the poison cyanide is an irreversible enzyme inhibitor that combines with the copper and iron in the active site of the enzyme cytochrome c oxidase and blocks cellular respiration. Enzyme production (transcription and translation of enzyme genes) can be enhanced or diminished by a cell in response to changes in the cell’s environment. This form of gene regulation is called enzyme induction. For example, bacteria may become resistant to antibiotics such as penicillin because enzymes called beta-lactamases are induced that hydrolyse the crucial beta-lactam ring within the penicillin molecule. Another example comes from enzymes in the liver called cytochrome P450 oxidases, which are important in drug metabolism. Induction or inhibition of these enzymes can cause drug interactions. Enzyme levels can also be regulated by changing the rate of enzyme degradation. :30.1.1 The opposite of enzyme induction is enzyme repression. One example of enzyme deficiency is the most common type of phenylketonuria. Many different single amino acid mutations in the enzyme phenylalanine hydroxylase, which catalyzes the first step in the degradation of phenylalanine, result in build-up of phenylalanine and related products. 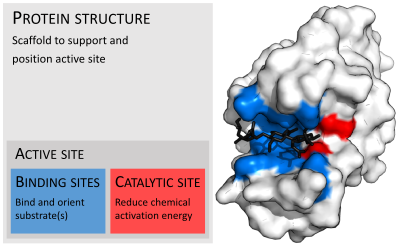 Some mutations are in the active site, directly disrupting binding and catalysis, but many are far from the active site and reduce activity by destabilising the protein structure, or affecting correct oligomerisation. This can lead to intellectual disability if the disease is untreated. Another example is pseudocholinesterase deficiency, in which the body’s ability to break down choline ester drugs is impaired. Oral administration of enzymes can be used to treat some functional enzyme deficiencies, such as pancreatic insufficiency and lactose intolerance. Enzymes are used in the chemical industry and other industrial applications when extremely specific catalysts are required. Enzymes in general are limited in the number of reactions they have evolved to catalyze and also by their lack of stability in organic solvents and at high temperatures. As a consequence, protein engineering is an active area of research and involves attempts to create new enzymes with novel properties, either through rational design or in vitro evolution. These efforts have begun to be successful, and a few enzymes have now been designed “from scratch” to catalyze reactions that do not occur in nature. ^ Murphy JM, Farhan H, Eyers PA (2017). “Bio-Zombie: the rise of pseudoenzymes in biology”. Biochem Soc Trans. 45: 537–544. doi:10.1042/bst20160400. ^ Murphy JM, et al. (2014). “A robust methodology to subclassify pseudokinases based on their nucleotide-binding properties”. Biochemical Journal. 457 (2): 323–334. doi:10.1042/BJ20131174. PMC 5679212. PMID 24107129. ^ Schomburg I, Chang A, Placzek S, Söhngen C, Rother M, Lang M, Munaretto C, Ulas S, Stelzer M, Grote A, Scheer M, Schomburg D (January 2013). “BRENDA in 2013: integrated reactions, kinetic data, enzyme function data, improved disease classification: new options and contents in BRENDA”. Nucleic Acids Research. 41 (Database issue): D764–72. doi:10.1093/nar/gks1049. PMC 3531171. PMID 23203881. ^ Radzicka A, Wolfenden R (January 1995). “A proficient enzyme”. Science. 267 (5194): 90–931. Bibcode:1995Sci…267…90R. doi:10.1126/science.7809611. PMID 7809611. ^ Callahan BP, Miller BG (December 2007). “OMP decarboxylase—An enigma persists”. Bioorganic Chemistry. 35 (6): 465–9. doi:10.1016/j.bioorg.2007.07.004. PMID 17889251. ^ de Réaumur RA (1752). “Observations sur la digestion des oiseaux”. Histoire de l’academie royale des sciences. 1752: 266, 461. ^ Payen A, Persoz JF (1833). “Mémoire sur la diastase, les principaux produits de ses réactions et leurs applications aux arts industriels” [Memoir on diastase, the principal products of its reactions, and their applications to the industrial arts]. Annales de chimie et de physique. 2nd (in French). 53: 73–92. ^ Manchester KL (December 1995). “Louis Pasteur (1822–1895)–chance and the prepared mind”. Trends in Biotechnology. 13 (12): 511–5. doi:10.1016/S0167-7799(00)89014-9. PMID 8595136. ^ Holmes FL (2003). “Enzymes”. In Heilbron JL. The Oxford Companion to the History of Modern Science. Oxford: Oxford University Press. p. 270. ^ “Eduard Buchner”. Nobel Laureate Biography. Nobelprize.org. Retrieved 23 February 2015. ^ “Eduard Buchner – Nobel Lecture: Cell-Free Fermentation”. Nobelprize.org. 1907. Retrieved 23 February 2015. ^ The naming of enzymes by adding the suffix “-ase” to the substrate on which the enzyme acts, has been traced to French scientist Émile Duclaux (1840–1904), who intended to honor the discoverers of diastase – the first enzyme to be isolated – by introducing this practice in his book Duclaux E (1899). Traité de microbiologie: Diastases, toxines et venins [Microbiology Treatise: diastases, toxins and venoms] (in French). Paris, France: Masson and Co. See Chapter 1, especially page 9. ^ Willstätter R (1927). “Faraday lecture. Problems and methods in enzyme research”. Journal of the Chemical Society (Resumed): 1359. doi:10.1039/JR9270001359. quoted in Blow D (April 2000). “So do we understand how enzymes work?” (pdf). Structure. 8 (4): R77–R81. doi:10.1016/S0969-2126(00)00125-8. PMID 10801479. ^ “Nobel Prizes and Laureates: The Nobel Prize in Chemistry 1946”. Nobelprize.org. Retrieved 23 February 2015. ^ Blake CC, Koenig DF, Mair GA, North AC, Phillips DC, Sarma VR (May 1965). “Structure of hen egg-white lysozyme. A three-dimensional Fourier synthesis at 2 Ångström resolution”. Nature. 206 (4986): 757–61. Bibcode:1965Natur.206..757B. doi:10.1038/206757a0. PMID 5891407. ^ Johnson LN, Petsko GA (1999). “David Phillips and the origin of structural enzymology”. Trends Biochem. Sci. 24 (7): 287–9. doi:10.1016/S0968-0004(99)01423-1. PMID 10390620. ^ Nomenclature Committee. “Classification and Nomenclature of Enzymes by the Reactions they Catalyse”. International Union of Biochemistry and Molecular Biology (NC-IUBMB). School of Biological and Chemical Sciences, Queen Mary, University of London. Archived from the original on 17 March 2015. Retrieved 6 March 2015. ^ Nomenclature Committee. “EC 2.7.1.1”. International Union of Biochemistry and Molecular Biology (NC-IUBMB). School of Biological and Chemical Sciences, Queen Mary, University of London. Archived from the original on 1 December 2014. Retrieved 6 March 2015. ^ Anfinsen CB (July 1973). “Principles that govern the folding of protein chains”. Science. 181 (4096): 223–30. Bibcode:1973Sci…181..223A. doi:10.1126/science.181.4096.223. PMID 4124164. ^ Dunaway-Mariano D (November 2008). “Enzyme function discovery”. Structure. 16 (11): 1599–600. doi:10.1016/j.str.2008.10.001. PMID 19000810. ^ Petsko GA, Ringe D (2003). “Chapter 1: From sequence to structure”. Protein structure and function. London: New Science. p. 27. ISBN 978-1405119221. ^ Chen LH, Kenyon GL, Curtin F, Harayama S, Bembenek ME, Hajipour G, Whitman CP (September 1992). “4-Oxalocrotonate tautomerase, an enzyme composed of 62 amino acid residues per monomer”. The Journal of Biological Chemistry. 267 (25): 17716–21. PMID 1339435. ^ Smith S (December 1994). “The animal fatty acid synthase: one gene, one polypeptide, seven enzymes”. FASEB Journal. 8 (15): 1248–59. PMID 8001737. ^ “The Catalytic Site Atlas”. The European Bioinformatics Institute. Retrieved 4 April 2007. ^ a b Suzuki H (2015). “Chapter 7: Active Site Structure”. How Enzymes Work: From Structure to Function. Boca Raton, FL: CRC Press. pp. 117–140. ISBN 978-981-4463-92-8. ^ Krauss G (2003). “The Regulations of Enzyme Activity”. Biochemistry of Signal Transduction and Regulation (3rd ed.). Weinheim: Wiley-VCH. pp. 89–114. ISBN 9783527605767. ^ Jaeger KE, Eggert T (August 2004). “Enantioselective biocatalysis optimized by directed evolution”. Current Opinion in Biotechnology. 15 (4): 305–13. doi:10.1016/j.copbio.2004.06.007. PMID 15358000. ^ Shevelev IV, Hübscher U (May 2002). “The 3′ 5′ exonucleases”. Nature Reviews Molecular Cell Biology. 3 (5): 364–76. doi:10.1038/nrm804. PMID 11988770. ^ Zenkin N, Yuzenkova Y, Severinov K (July 2006). “Transcript-assisted transcriptional proofreading”. Science. 313 (5786): 518–20. Bibcode:2006Sci…313..518Z. doi:10.1126/science.1127422. PMID 16873663. ^ Ibba M, Soll D (2000). “Aminoacyl-tRNA synthesis”. Annual Review of Biochemistry. 69: 617–50. doi:10.1146/annurev.biochem.69.1.617. PMID 10966471. ^ Rodnina MV, Wintermeyer W (2001). “Fidelity of aminoacyl-tRNA selection on the ribosome: kinetic and structural mechanisms”. Annual Review of Biochemistry. 70: 415–35. doi:10.1146/annurev.biochem.70.1.415. PMID 11395413. ^ Khersonsky O, Tawfik DS (2010). “Enzyme promiscuity: a mechanistic and evolutionary perspective”. Annual Review of Biochemistry. 79: 471–505. doi:10.1146/annurev-biochem-030409-143718. PMID 20235827. ^ O’Brien PJ, Herschlag D (April 1999). “Catalytic promiscuity and the evolution of new enzymatic activities”. Chemistry & Biology. 6 (4): R91–R105. doi:10.1016/S1074-5521(99)80033-7. PMID 10099128. ^ Cooper GM (2000). “Chapter 2.2: The Central Role of Enzymes as Biological Catalysts”. The Cell: a Molecular Approach (2nd ed.). Washington (DC ): ASM Press. ISBN 0-87893-106-6. ^ Koshland DE (February 1958). “Application of a Theory of Enzyme Specificity to Protein Synthesis”. Proceedings of the National Academy of Sciences of the United States of America. 44 (2): 98–104. Bibcode:1958PNAS…44…98K. doi:10.1073/pnas.44.2.98. PMC 335371. PMID 16590179. ^ Vasella A, Davies GJ, Böhm M (October 2002). “Glycosidase mechanisms”. Current Opinion in Chemical Biology. 6 (5): 619–29. doi:10.1016/S1367-5931(02)00380-0. PMID 12413546. ^ Boyer R (2002). “Chapter 6: Enzymes I, Reactions, Kinetics, and Inhibition”. Concepts in Biochemistry (2nd ed.). New York, Chichester, Weinheim, Brisbane, Singapore, Toronto. : John Wiley & Sons, Inc. pp. 137–8. ISBN 0-470-00379-0. OCLC 51720783. ^ Savir Y, Tlusty T (2007). Scalas E, ed. “Conformational proofreading: the impact of conformational changes on the specificity of molecular recognition” (PDF). PLoS ONE. 2 (5): e468. Bibcode:2007PLoSO…2..468S. doi:10.1371/journal.pone.0000468. PMC 1868595. PMID 17520027. ^ Warshel A, Sharma PK, Kato M, Xiang Y, Liu H, Olsson MH (August 2006). “Electrostatic basis for enzyme catalysis”. Chemical Reviews. 106 (8): 3210–35. doi:10.1021/cr0503106. PMID 16895325. ^ Cox MM, Nelson DL (2013). “Chapter 6.2: How enzymes work”. Lehninger Principles of Biochemistry (6th ed.). New York, N.Y.: W.H. Freeman. p. 195. ISBN 978-1464109621. ^ Benkovic SJ, Hammes-Schiffer S (August 2003). “A perspective on enzyme catalysis”. Science. 301 (5637): 1196–202. Bibcode:2003Sci…301.1196B. doi:10.1126/science.1085515. PMID 12947189. ^ Villa J, Strajbl M, Glennon TM, Sham YY, Chu ZT, Warshel A (October 2000). “How important are entropic contributions to enzyme catalysis?”. Proceedings of the National Academy of Sciences of the United States of America. 97 (22): 11899–904. Bibcode:2000PNAS…9711899V. doi:10.1073/pnas.97.22.11899. PMC 17266. PMID 11050223. ^ Polgár, L. (2005-07-07). “The catalytic triad of serine peptidases”. Cellular and Molecular Life Sciences. 62 (19–20): 2161–2172. doi:10.1007/s00018-005-5160-x. ISSN 1420-682X. PMID 16003488. ^ Ramanathan A, Savol A, Burger V, Chennubhotla CS, Agarwal PK (2014). “Protein conformational populations and functionally relevant substates”. Acc. Chem. Res. 47 (1): 149–56. doi:10.1021/ar400084s. PMID 23988159. ^ Tsai CJ, Del Sol A, Nussinov R (2009). “Protein allostery, signal transmission and dynamics: a classification scheme of allosteric mechanisms” (PDF). Mol Biosyst. 5 (3): 207–16. doi:10.1039/b819720b. PMC 2898650. PMID 19225609. ^ Changeux JP, Edelstein SJ (June 2005). “Allosteric mechanisms of signal transduction”. Science. 308 (5727): 1424–8. Bibcode:2005Sci…308.1424C. doi:10.1126/science.1108595. PMID 15933191. ^ de Bolster M (1997). “Glossary of Terms Used in Bioinorganic Chemistry: Cofactor”. International Union of Pure and Applied Chemistry. Archived from the original on 21 January 2017. Retrieved 30 October 2007. ^ Chapman-Smith A, Cronan JE (1999). “The enzymatic biotinylation of proteins: a post-translational modification of exceptional specificity”. Trends Biochem. Sci. 24 (9): 359–63. doi:10.1016/s0968-0004(99)01438-3. PMID 10470036. ^ Fisher Z, Hernandez Prada JA, Tu C, Duda D, Yoshioka C, An H, Govindasamy L, Silverman DN, McKenna R (February 2005). “Structural and kinetic characterization of active-site histidine as a proton shuttle in catalysis by human carbonic anhydrase II”. Biochemistry. 44 (4): 1097–115. doi:10.1021/bi0480279. PMID 15667203. ^ “BRENDA The Comprehensive Enzyme Information System”. Technische Universität Braunschweig. Retrieved 23 February 2015. ^ Törnroth-Horsefield S, Neutze R (December 2008). “Opening and closing the metabolite gate”. Proceedings of the National Academy of Sciences of the United States of America. 105 (50): 19565–6. Bibcode:2008PNAS..10519565T. doi:10.1073/pnas.0810654106. PMC 2604989. PMID 19073922. ^ McArdle WD, Katch F, Katch VL (2006). “Chapter 9: The Pulmonary System and Exercise”. Essentials of Exercise Physiology (3rd ed.). Baltimore, Maryland: Lippincott Williams & Wilkins. pp. 312–3. ISBN 978-0781749916. ^ Michaelis L, Menten M (1913). “Die Kinetik der Invertinwirkung” [The Kinetics of Invertase Action]. Biochem. Z. (in German). 49: 333–369. ; Michaelis L, Menten ML, Johnson KA, Goody RS (2011). “The original Michaelis constant: translation of the 1913 Michaelis-Menten paper”. Biochemistry. 50 (39): 8264–9. doi:10.1021/bi201284u. PMC 3381512. PMID 21888353. ^ Briggs GE, Haldane JB (1925). “A Note on the Kinetics of Enzyme Action”. The Biochemical Journal. 19 (2): 339–339. doi:10.1042/bj0190338. PMC 1259181. PMID 16743508. ^ Bar-Even A, Noor E, Savir Y, Liebermeister W, Davidi D, Tawfik DS, Milo R (2011). “The moderately efficient enzyme: evolutionary and physicochemical trends shaping enzyme parameters”. Biochemistry. 50 (21): 4402–10. doi:10.1021/bi2002289. PMID 21506553. ^ Ellis RJ (October 2001). “Macromolecular crowding: obvious but underappreciated”. Trends in Biochemical Sciences. 26 (10): 597–604. doi:10.1016/S0968-0004(01)01938-7. PMID 11590012. ^ Kopelman R (September 1988). “Fractal reaction kinetics”. Science. 241 (4873): 1620–26. Bibcode:1988Sci…241.1620K. doi:10.1126/science.241.4873.1620. PMID 17820893. ^ a b Goodsell, David S. (1999-08-01). “The Molecular Perspective: Methotrexate”. The Oncologist. 4 (4): 340–341. ISSN 1083-7159. PMID 10476546. ^ Price NC (1979). “What is meant by ‘competitive inhibition’?”. Trends in Biochemical Sciences. 4 (11): N272–N273. doi:10.1016/0968-0004(79)90205-6. ^ “Allosteric small-molecule kinase inhibitors”. Pharmacology & Therapeutics. 156: 59–68. 2015-12-01. doi:10.1016/j.pharmthera.2015.10.002. ISSN 0163-7258. ^ Cornish-Bowden A (July 1986). “Why is uncompetitive inhibition so rare? A possible explanation, with implications for the design of drugs and pesticides”. FEBS Letters. 203 (1): 3–6. doi:10.1016/0014-5793(86)81424-7. PMID 3720956. ^ Strelow, John M. (2017-01-01). “A Perspective on the Kinetics of Covalent and Irreversible Inhibition”. SLAS DISCOVERY: Advancing Life Sciences R&D. 22 (1): 3–20. doi:10.1177/1087057116671509. ISSN 2472-5552. PMID 27703080. ^ Fisher JF, Meroueh SO, Mobashery S (February 2005). “Bacterial resistance to beta-lactam antibiotics: compelling opportunism, compelling opportunity”. Chemical Reviews. 105 (2): 395–424. doi:10.1021/cr030102i. PMID 15700950. ^ a b Johnson DS, Weerapana E, Cravatt BF (June 2010). “Strategies for discovering and derisking covalent, irreversible enzyme inhibitors”. Future Medicinal Chemistry. 2 (6): 949–64. doi:10.4155/fmc.10.21. PMC 2904065. PMID 20640225. ^ Endo A (1 November 1992). “The discovery and development of HMG-CoA reductase inhibitors” (PDF). J. Lipid Res. 33 (11): 1569–82. PMID 1464741. ^ Wlodawer A, Vondrasek J (1998). 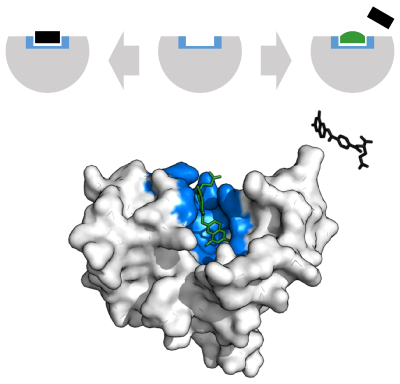 “Inhibitors of HIV-1 protease: a major success of structure-assisted drug design”. Annual Review of Biophysics and Biomolecular Structure. 27: 249–84. doi:10.1146/annurev.biophys.27.1.249. PMID 9646869. ^ Yoshikawa S, Caughey WS (May 1990). “Infrared evidence of cyanide binding to iron and copper sites in bovine heart cytochrome c oxidase. Implications regarding oxygen reduction”. The Journal of Biological Chemistry. 265 (14): 7945–58. PMID 2159465. ^ Hunter T (January 1995). “Protein kinases and phosphatases: the yin and yang of protein phosphorylation and signaling”. Cell. 80 (2): 225–36. doi:10.1016/0092-8674(95)90405-0. PMID 7834742. ^ Berg JS, Powell BC, Cheney RE (April 2001). “A millennial myosin census”. Molecular Biology of the Cell. 12 (4): 780–94. doi:10.1091/mbc.12.4.780. PMC 32266. PMID 11294886. ^ Meighen EA (March 1991). “Molecular biology of bacterial bioluminescence”. Microbiological Reviews. 55 (1): 123–42. PMC 372803. PMID 2030669. ^ De Clercq E (2002). “Highlights in the development of new antiviral agents”. Mini Rev Med Chem. 2 (2): 163–75. doi:10.2174/1389557024605474. PMID 12370077. ^ Mackie RI, White BA (October 1990). “Recent advances in rumen microbial ecology and metabolism: potential impact on nutrient output”. Journal of Dairy Science. 73 (10): 2971–95. doi:10.3168/jds.S0022-0302(90)78986-2. PMID 2178174. ^ Rouzer CA, Marnett LJ (2009). “Cyclooxygenases: structural and functional insights”. J. Lipid Res. 50 Suppl: S29–34. doi:10.1194/jlr.R800042-JLR200. PMC 2674713. PMID 18952571. ^ a b c d Suzuki H (2015). “Chapter 8: Control of Enzyme Activity”. How Enzymes Work: From Structure to Function. Boca Raton, FL: CRC Press. pp. 141–69. ISBN 978-981-4463-92-8. ^ Doble BW, Woodgett JR (April 2003). “GSK-3: tricks of the trade for a multi-tasking kinase”. Journal of Cell Science. 116 (Pt 7): 1175–86. doi:10.1242/jcs.00384. PMC 3006448. PMID 12615961. ^ Bennett PM, Chopra I (1993). “Molecular basis of beta-lactamase induction in bacteria” (PDF). Antimicrob. Agents Chemother. 37 (2): 153–8. doi:10.1128/aac.37.2.153. PMC 187630. PMID 8452343. ^ Skett P, Gibson GG (2001). “Chapter 3: Induction and Inhibition of Drug Metabolism”. Introduction to Drug Metabolism (3 ed.). Cheltenham, UK: Nelson Thornes Publishers. pp. 87–118. ISBN 978-0748760114. ^ Faergeman NJ, Knudsen J (April 1997). “Role of long-chain fatty acyl-CoA esters in the regulation of metabolism and in cell signalling”. The Biochemical Journal. 323 (Pt 1): 1–12. PMC 1218279. PMID 9173866. ^ Suzuki H (2015). “Chapter 4: Effect of pH, Temperature, and High Pressure on Enzymatic Activity”. How Enzymes Work: From Structure to Function. Boca Raton, FL: CRC Press. pp. 53–74. ISBN 978-981-4463-92-8. ^ Noree C, Sato BK, Broyer RM, Wilhelm JE (August 2010). “Identification of novel filament-forming proteins in Saccharomyces cerevisiae and Drosophila melanogaster”. The Journal of Cell Biology. 190 (4): 541–51. doi:10.1083/jcb.201003001. PMC 2928026. PMID 20713603. ^ Aughey GN, Liu JL (2015). “Metabolic regulation via enzyme filamentation”. Critical Reviews in Biochemistry and Molecular Biology. 51 (4): 282–93. doi:10.3109/10409238.2016.1172555. PMC 4915340. PMID 27098510. ^ Kamata K, Mitsuya M, Nishimura T, Eiki J, Nagata Y (March 2004). “Structural basis for allosteric regulation of the monomeric allosteric enzyme human glucokinase”. Structure. 12 (3): 429–38. doi:10.1016/j.str.2004.02.005. PMID 15016359. ^ Froguel P, Zouali H, Vionnet N, Velho G, Vaxillaire M, Sun F, Lesage S, Stoffel M, Takeda J, Passa P (March 1993). “Familial hyperglycemia due to mutations in glucokinase. Definition of a subtype of diabetes mellitus”. The New England Journal of Medicine. 328 (10): 697–702. doi:10.1056/NEJM199303113281005. PMID 8433729. ^ Okada S, O’Brien JS (August 1969). “Tay–Sachs disease: generalized absence of a beta-D-N-acetylhexosaminidase component”. Science. 165 (3894): 698–700. Bibcode:1969Sci…165..698O. doi:10.1126/science.165.3894.698. PMID 5793973. ^ “Learning About Tay–Sachs Disease”. U.S. National Human Genome Research Institute. Retrieved 1 March 2015. ^ Erlandsen H, Stevens RC (October 1999). “The structural basis of phenylketonuria”. Molecular Genetics and Metabolism. 68 (2): 103–25. doi:10.1006/mgme.1999.2922. PMID 10527663. ^ Flatmark T, Stevens RC (August 1999). “Structural Insight into the Aromatic Amino Acid Hydroxylases and Their Disease-Related Mutant Forms”. Chemical Reviews. 99 (8): 2137–2160. doi:10.1021/cr980450y. PMID 11849022. ^ “Phenylketonuria”. Genes and Disease [Internet]. Bethesda (MD): National Center for Biotechnology Information (US). 1998–2015. ^ “Pseudocholinesterase deficiency”. U.S. National Library of Medicine. Retrieved 5 September 2013. ^ Fieker A, Philpott J, Armand M (2011). “Enzyme replacement therapy for pancreatic insufficiency: present and future”. Clinical and Experimental Gastroenterology. 4: 55–73. doi:10.2147/CEG.S17634. PMC 3132852. PMID 21753892. ^ Misselwitz B, Pohl D, Frühauf H, Fried M, Vavricka SR, Fox M (June 2013). “Lactose malabsorption and intolerance: pathogenesis, diagnosis and treatment”. United European Gastroenterology Journal. 1 (3): 151–9. doi:10.1177/2050640613484463. PMC 4040760. PMID 24917953. ^ Cleaver JE (May 1968). “Defective repair replication of DNA in xeroderma pigmentosum”. Nature. 218 (5142): 652–6. Bibcode:1968Natur.218..652C. doi:10.1038/218652a0. PMID 5655953. ^ James WD, Elston D, Berger TG (2011). Andrews’ Diseases of the Skin: Clinical Dermatology (11th ed.). London: Saunders/ Elsevier. p. 567. ISBN 978-1437703146. ^ Renugopalakrishnan V, Garduño-Juárez R, Narasimhan G, Verma CS, Wei X, Li P (November 2005). “Rational design of thermally stable proteins: relevance to bionanotechnology”. Journal of Nanoscience and Nanotechnology. 5 (11): 1759–1767. doi:10.1166/jnn.2005.441. PMID 16433409. ^ Hult K, Berglund P (August 2003). “Engineered enzymes for improved organic synthesis”. Current Opinion in Biotechnology. 14 (4): 395–400. doi:10.1016/S0958-1669(03)00095-8. PMID 12943848. ^ Jiang L, Althoff EA, Clemente FR, Doyle L, Röthlisberger D, Zanghellini A, Gallaher JL, Betker JL, Tanaka F, Barbas CF, Hilvert D, Houk KN, Stoddard BL, Baker D (March 2008). “De novo computational design of retro-aldol enzymes”. Science. 319 (5868): 1387–91. Bibcode:2008Sci…319.1387J. doi:10.1126/science.1152692. PMC 3431203. PMID 18323453. ^ a b Sun Y, Cheng J (May 2002). “Hydrolysis of lignocellulosic materials for ethanol production: a review”. Bioresource Technology. 83 (1): 1–11. doi:10.1016/S0960-8524(01)00212-7. PMID 12058826. ^ a b Kirk O, Borchert TV, Fuglsang CC (August 2002). “Industrial enzyme applications”. Current Opinion in Biotechnology. 13 (4): 345–351. doi:10.1016/S0958-1669(02)00328-2. PMID 12323357. ^ Dulieu C, Moll M, Boudrant J, Poncelet D (2000). “Improved performances and control of beer fermentation using encapsulated alpha-acetolactate decarboxylase and modeling”. Biotechnology Progress. 16 (6): 958–65. doi:10.1021/bp000128k. PMID 11101321. ^ “Chymosin – GMO Database”. GMO Compass. European Union. 10 July 2010. Archived from the original on 26 March 2015. Retrieved 1 March 2015. ^ Molimard P, Spinnler HE (February 1996). “Review: Compounds Involved in the Flavor of Surface Mold-Ripened Cheeses: Origins and Properties”. Journal of Dairy Science. 79 (2): 169–184. doi:10.3168/jds.S0022-0302(96)76348-8. ^ Guzmán-Maldonado H, Paredes-López O (September 1995). “Amylolytic enzymes and products derived from starch: a review”. Critical Reviews in Food Science and Nutrition. 35 (5): 373–403. doi:10.1080/10408399509527706. PMID 8573280. ^ a b “Protease – GMO Database”. GMO Compass. European Union. 10 July 2010. Archived from the original on 24 February 2015. Retrieved 28 February 2015. ^ Alkorta I, Garbisu C, Llama MJ, Serra JL (January 1998). “Industrial applications of pectic enzymes: a review”. Process Biochemistry. 33 (1): 21–28. doi:10.1016/S0032-9592(97)00046-0. ^ Bajpai P (March 1999). “Application of enzymes in the pulp and paper industry”. Biotechnology Progress. 15 (2): 147–157. doi:10.1021/bp990013k. PMID 10194388. ^ Begley CG, Paragina S, Sporn A (March 1990). “An analysis of contact lens enzyme cleaners”. Journal of the American Optometric Association. 61 (3): 190–4. PMID 2186082. ^ Farris PL (2009). “Economic Growth and Organization of the U.S. Starch Industry”. In BeMiller JN, Whistler RL. Starch Chemistry and Technology (3rd ed.). London: Academic. ISBN 9780080926551.